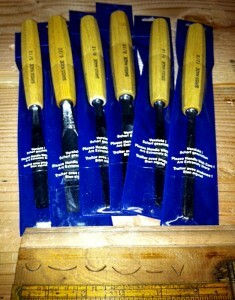 Here is what I’m calling my “Peter Follansbee Carving Kit” and what sizes I got to match his. I came pretty close I think. For reference here is his original posted picture. 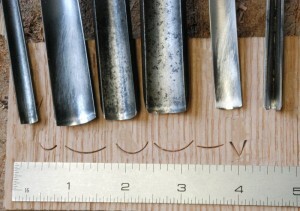 I’m working on a box right now that I hope to be able to try some of this style carving on using these tools. I would also highly recommend picking up his DVD on the subject of 17th Century Carving. It’s what me inspired to try out the style of carving he shows on the disc. Once I watched it I started looking at period carving in a whole new way. Like I could actually do some of that stuff, just maybe. I am going to try my hand at it soon, wish me luck! P.S.S. I also am not advocating the Pfeil brand over any other brand, I just had a gift card to the store and they are local to me. The quality is decent from what I can tell, but I will bet you can find similar or better quality tools in other stores.